The tentative plan for this weekend is to depart the Red River Valley in east-central North Dakota, maneuver up to the northeastern part of the state, and then work my way back down to Bismarck, taking a small detour by the abandoned Stanley R. Mickelsen Safeguard complex (SRMS complex) just outside of Nekoma, North Dakota. This complex was initially or eventually tied in with some super bunker located — as the reality and lore goes — somewhere deep in the granite mountains that are the Colorado Rockies. 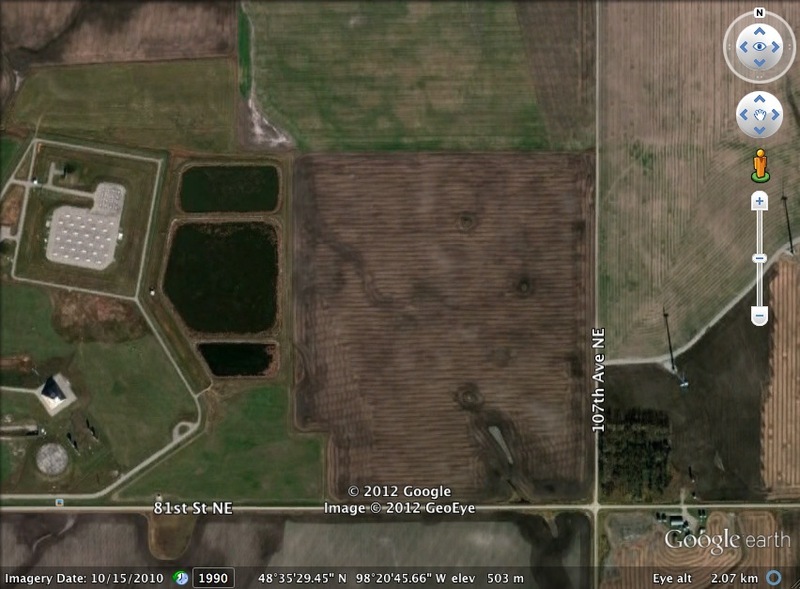 In any case, since 2007 I have referred to the SRMS complex in North Dakota as The Nixon Bunker. A Google Earth image of the pyramid Stanley Mickelson complex (at left) and wind turbines and shadows (at right). At some point between 2002 and 2005 (I have to check dates — I know at least it was between 2002 and 2008), I was assigned to a crew that conducted linear pedestrian archaeological surface investigations (aka, walking mile after mile in a straight line while looking at the ground), and these surveys fell within visual orbit of the SRMS complex. Perhaps paradoxically, or ironically — or neither or both — in the first decade of the 21st century while walking in a linear survey corridor I found myself surveying and thinking the following: while Green Energy wind turbines were on the proposed construction docket, all of this would be installed right near a former vestige or reflection of potentially imminent nuclear holocaust. Today in 2012 the SRMS complex appears as though it belongs in some kind of zombie flick. There is a thought as well that in 15,000 years, when anthropologists and archaeologists from a completely different culture come across this pyramid, they will infer that it was built for religious reasons. No doubt, conspiracy theorists will by then have asserted that aliens were ultimately responsible for it, and the Pink Floyd equivalent will hold a rock concert (or whatever they will call it in 15,000 years) at the pyramid base, complete with light show and sand (since climate change will have turned this part of North Dakota into a Hudson’s Bay beach by this point). 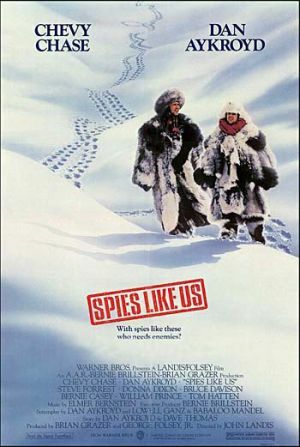 Classic "Spies Like Us" (1985 or thereabouts) poster. Pontification is fun that way. Back to reality: the steady winds in the central part of North America are as good a place as any to install wind turbines and nuke bunkers. This particular location has been a point of interest for that reason: on the one hand, it was isolated from major population centers and provided a fairly direct route over the North Pole to the now former USSR (which is why B-52 bomber wings were respectively attached to the Minot and Grand Forks air force bases); and on the other hand this local is a highway for the wind tunnel that rips where ever it wants through the northern Great Plains (or North American Steppe in general). Scholarship on all of this continues. In one protracted study, Dr. David Mills recognized the monetary benefits of this installation, at least as it pertained to the immediate area. In other national contexts, several Hollywood films incorporated this late-1960s Soviet ICBM interception system into fictional screen plays. Perhaps one of the most notable (at least in my formative adolescent years in the 1980s) was the Cold War Comedy, “Spies Like Us” (1985), which made the otherwise understandable paranoid social psyche of the world manageable by couching potential nuclear armageddon in humor and ridiculousness — thank you Chevy Chase and Dan Aykroyd, true Cold War patriots. Anyhow, future updates and photos from this reconnaissance are pending. This entry was posted on Thursday, February 2nd, 2012 at 10:58 pm	and posted in Uncategorized. You can follow any responses to this entry through the RSS 2.0 feed.